This is a continuation of my William Stringfellow Project where I read through all of William Stringfellow's books in chronological order in their first editions. This is the third installment of this series. We've already done the first two of Stringfellow's books--A Private and Public Faith (parts 1, 2, 3, and 4) and Instead of Death. In this post we turn to Stringfellow's third book My People is the Enemy: An Autobiographical Polemic. 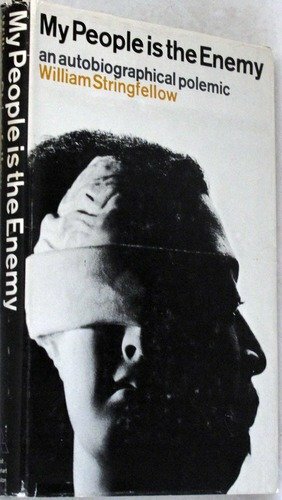 My People is the Enemy was published in 1964 (original dust jacket pictured here) and was the first of what would become a distinctive style of Stringfellow's, the theological memoir where Stringfellow blends his autobiography with theological and political analysis. My People is the Enemy is my favorite book of Stringfellow's. Perhaps because this part of Stringfellow's biography is so compelling. For My People is the Enemy recounts Stringfellow's reflections about living in Harlem after he had graduated from Harvard Law School. At the time of the writing Stringfellow had lived in Harlem for seven years. This sets the subject matter of the book which is focused on race relations and urban poverty. Much of the material in the book is dated as Stringfellow always wrote to the issues of his day, speaking concretely about politicians, policies, and events in 1964, both nationally and in NYC. (This is why I don't recommend My People is the Enemy to others despite the book being my personal favorite.) But the issues Stringfellow was wrestling with are still very much with us. I had taken one precaution for my first inspection of the premises--I had a DDT bomb (of the sort that was used in the Army), which I had picked up at a military surplus store. I entered the apartment and looked around. I found a dead mouse in the toilet, which I disposed of. I opened a window, so as not to DDT myself, and then I released the bomb. I sat down on something for a moment to see what would happen. From everywhere--from every crack and corner, from the ceilings and walls and from underneath the linoleum, from out of the refrigerator and the stove, from in back of the sink and under the bathtub, from every place--came swarms of creeping, crawling vermin. I shuddered. I remember saying out loud to myself, "Stringfellow, you will never know here whether you have become an alcoholic." Who could tell, in such a place, whether or not he is having delirium tremens? The first part of the book deals mainly with poverty and the second half turns to race relations. Poverty is vulnerability to death in its crudest forms. Poverty is the relentless daily attrition of contending with the most primitive concerns of human existence: food and cleanliness and cloths and heat and housing and rest and play and work. ...All men, in short, live in a history in which every action and omission and abstention is consequently related to all else that happens everywhere. That is the theology of Adam's Fall and with him, the fall of all men. In history, we live at each other's expense. 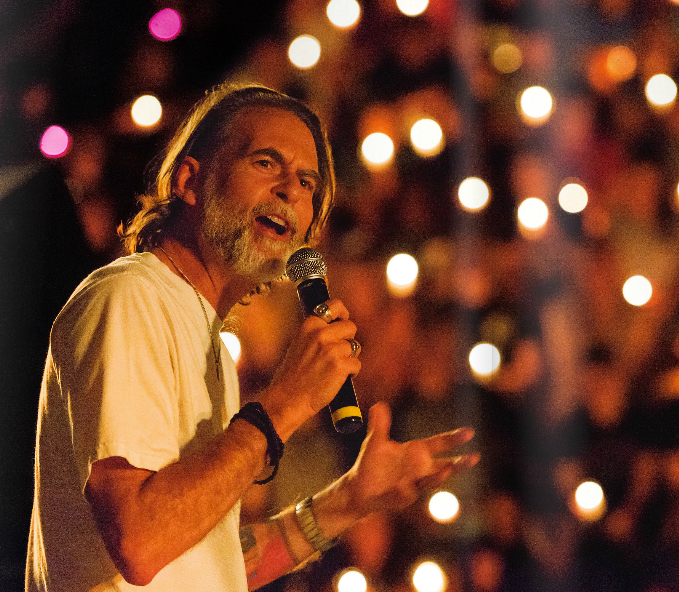 For Stringfellow, then, the heart of the Christian witness is to step into this state of vulnerability as a sacrament of resurrection, to bear witness to life in the midst of death's works. This is why the Christian witness is most potent among and with the poor. Among the poor the power of death at work in all our our lives becomes most obvious and, thus, creates the location where the witness of resurrection is most clearly revealed. This is why the work of God is most clearly observed among "the least of these." The Word of God is present among the poor as well as among all others, and what I have called earlier the piety of the poor reveals the Word of God. The piety of the poor is prophetic: In a funny, distorted, ambiguous way it anticipates the Gospel. This is confirmed every day in East Harlem. There is a boy in the neighborhood, for instance, who is addicted to narcotics and whom I have defended in some of his troubles with the law. He used to stop in often on Saturday mornings to shave and wash up, after having spent most of the week on the streets. He has been addicted for a long time. His father threw him out about three years ago, when he was first arrested. He has contrived so many stories to induce clergy and social workers to give him money to support his habit that he is no longer believed when he asks for help. His addiction is heavy enough and has been prolonged enough so that he now shows symptoms of other trouble—his health is broken by years of undernourishment and insufficient sleep. He is dirty, ignorant, arrogant, dishonest, unemployable, broken, unreliable, ugly, rejected, alone. And he knows it. He knows at last that he has nothing to commend himself to another human being. He has nothing to offer. There is nothing about him that permits the love of another person for him. He is unlovable. Yet it is exactly in his own confession that he does not deserve the love of another that he represents all the rest of us. For none of us is different from him in this regard. We are all unlovable. More than that, the action of this boy's life points beyond itself, it points to the Gospel, to God who loves us though we hate Him, who loves us though we do not satisfy His love, who loves us though we do not please Him, who loves us not for our sake but for His own sake, who loves us freely, who accepts us though we have nothing acceptable to offer Him. Hidden in the obnoxious existence of this boy is the scandalous secret of the Word of God. It is, after all, in Hell—in that estate where the presence of death is militant and pervasive—that the triumph of God over death in Jesus Christ is decisive and manifest. The Word of God is secretly present in the life of the poor, as in the life of the whole world, but most of the poor do not know the Word of God. These two facts constitute the dialectic of the Church's mission among the poor. All that is required for the mission of the Church in Harlem is there already, save one thing: the presence of the community which has and exercises the power to discern the presence of the Word of God in the ordinary life of the poor as it is lived everyday. What is requisite to mission, to the exposure of God's Word within the precarious and perishing existence of poverty, is the congregation which relies on and celebrates the resurrection. All that is required for the mission of the Church among the poor is there already, save one thing: the presence of the community which has and exercises the power to discern the presence of the Word of God in the ordinary life of the poor as it is lived everyday. What is requisite to mission, to the exposure of God's Word within the precarious and perishing existence of poverty, is the congregation which relies on and celebrates the resurrection. Dr. Beck, thank you. I had forgotten about the Stringfellow project being in the works. This is really good and helpful to me. The extermination of the Harlem tenement -- I lived in a place like that once as a kid. An old hotel converted to apartments. I was afraid to go to sleep at night, but you can't stay awake forever. The roaches! Currently, I am reading The Price of Inequality by Joseph Stiglitz with my Sunday morning book discussion group. Political science and economics are not my strong subjects, but this author strikes me as an expert who also has a heart. The reading is not light, but it is within my grasp. I'm understanding more of what has been done at a systemic level to perpetuate injustices. I'm gaining more confidence in my decision-making. Sometimes, with my nursing home friends, I see my purpose there with them as one of being a witness to their spiritual wealth, in the midst of great poverty. They have lost so much -- their health, their homes, their spouses, often there is no one to come visit them. But we keep holding on to the promises of God's love, and praying, and singing of our hope and gratitude. There's not much else I can do for them, except go and sit with them for a while each week, and remember with them what is good, true, and beautiful even in the midst of death. P.S. -- I just ran across a really interesting article at NPR online which talks about the connection between visual imagery and moral decision-making. I was thinking that this supports your exhortation to go. see. witness. If we never allow ourselves to see suffering or death, it's too easy to rationalize our indifference, or even harmful actions, and to maintain our distance. Dr. Beck, you wrote: "Most of us, being affluent, are relatively immune to these struggles which creates the illusion that death isn't at work in our lives. But the lives of the poor puncture this illusion. The struggles of the poor reveal the activity and power of death in the world. More, the poor witness to the fact that we, the affluent and rich, live at the expense of others." Why do you call that last idea a "fact?" Given the current political climate and Presidential election I can see why you would be curious. Though I do think all this is relevant to the current debates we are having in America I didn't have those things specifically in view. I was mainly talking about how we are all embedded in webs of complicity. For example, all the wealth created by American capitalism has been at the expense of the native inhabitants of North America. Not saying anything particularly political about that, just pointing out how America came to exist at the expense of others and how I benefit from that. A simpler example is that most businesses are hierarchically arranged with labor under mid-level managers on up to VPs and CEOs, etc. Two people might be equally qualified for a promotion within that system but there is only one position. Thus, my getting the promotion is a the expense of another. Again, that isn't unethical. It just points out how my estate is connected to and often at the expense of others. Same way if WalMart out-competes K Mart you have a employed WalMart people and unemployed K Mart people. Capitalism has that destructive aspect. Again, it's not unethical. Just pointing out that what happens to me is often connected to what happens to others. And that's Stringfellow's focus: The issue isn't about throwing stones but about pointing our our vulnerability to death. Many of us can insulate ourselves more or less from death, but often at the expense of others. That doesn't make me good and them bad or vice versa, just that death, our shared condition, is more readily seen in the lives of the poor. The piety of the poor, Stringfellow says, isn't in their virtue (they might, in fact, be a bunch of slackers). It's in their ability to make manifest, in their suffering, the power of death in their life and mine. That is, it's hard to see death at work in my life if I'm affluent, but death is still there. Being among the poor helps me see this more clearly. OK, it's clearer. Seems to me it's important to distinguish between truly zero-sum quantities (e. g., land, viz. the Native American example) and quantities that are decidedly not zero-sum, (e. g., aggregate wealth, employment opportunity, etc. ), when speaking of "living at the expense of another." The language of "at the expense of" is inescapably freighted with thick political overtones so that "throwing stones" (as you put it) is never far from hand when that language is used. 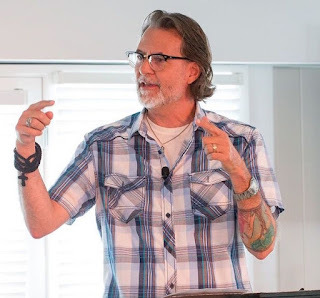 Of course, I'm not arguing that theology, Christianity, or even Stringfellow's project should be apolitical; just that asserting some dynamics and interpretations as "facts" begs the questions that asserting the "facts" seeks to bypass. And from one lover-of-the-thought-experiment to another, still, the notion of two people being equally qualified for a promotion (or anything else, for that matter) is a chimera, a sometimes useful idealization but nothing more than that. We all understand that fitness or potential to excel goes far beyond the experience, credentials, and other metrics that can be captured as quasi-objective data. Perhaps I'm far afield here. But it seems to me that some of this entire argument built by Stringfellow, granting its dense merits, takes rather a lot for granted that is yet highly debatable. I'd also add that we should also think about this globally and not just see the American economy as a closed system. The American economy thrives at the expense of other, weaker economies. And much of this is simply due to the accidents of history. We inherited capitalism from the Brits (well, Adam Smith was Scottish...). In addition, even these "non zero sum" economies are built upon finite resources. For example, oil is a finite, zero-sum resource and as those supplies dwindle those with the most power (economically and militarily) will be able to control it at the expense of others. The have's will be able to have at the expense of the have not's. There will be a time when Americans will be able to drive to work when others in the world cannot. Yes, American hard work has played a part in giving us this edge, not denying that, but we are also in this position because of luck and bloodshed. That's what I'm pointing to when I say "at the expense of others." And I'd argue that those are "facts." P. S. "...American hard work...luck and bloodshed"...and certain ideological assumptions vis-a-vis individual liberty and the origin of government's warrants to act! Why is it you question the idea? That is fascinating. I bet they knew of each other. Stringfellow, being a white lawyer in Harlem, would have stood out. And being a street lawyer Stringfellow would have been aware of crime rings.